I highly recommend it to fans of Slipknot or thrash metal in general, and while the above entry is partially censored, I'd highly recommend picking up an unedited copy (I bought it in MP3 format when it came out on Amazon) to get the full impact of the lyrics which are very intense. 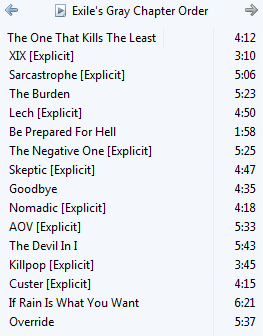 Being a longtime Slipknot fan, I have all their albums and while I always liked the first two more than Vol. 3: (The Subliminal Verses) (though I did still love that album, don't get me wrong) due to their heavier sounds, especially Iowa their second offering, .5: The Gray Chapter is like a perfect blend of the two styles, emitting the heavier sounds and thrash metal double bass and similar (drop B I think?) guitar tuning giving that lower, growlier sound to the riffs on most tracks. This custom order is based on everything from the sound effects/melodies at the beginning and end of each track to lyrics as well as the melodies of specific "hooks" or verses in the songs where they sometimes match or sound similar to components of other songs found elsewhere on the album. Also bear in mind that this is the original release version of the album, not the special edition with the bonus tracks (5 I think, with 2 numbered and 3 hidden) so I haven't accounted for those additional tracks in my custom order. Removed live hyperlink to unknown site. Bandcamp isn't really an unknown website though. It's been around longer than Soundcloud! Other songs by Wolfgun I listen to often include The Gift, Volk and Visions in Fire. For other types of music, I primarily listen to soundtracks from my favorite games, or occasionally movies. Daft Punk's work on the TRON Legacy soundtrack was excellent. I suggest to listen to the song below. NOTE. Alice's Restaurant is by Arlo Guthrie who is the son of one of the most famous US folk singers, Woodie Guthrie. Best known for the American anthem "This land is Your Land". The famous US folk singer Pete Seeger often played with Woodie and has a cameo in Arlo's film. Here in New England, it has been a long running staple for radio stations to play Alice's Restaurant on Thanksgiving. Most old stoners like this song. There are many that will keep you awake past your bedtime if you will allow it. There is even a restaurant here (in the stony woods) called Alice's Restaurant. It sticks to the tradition. Neil Young lives close by. And I can't walk away from this page without posting some Janis. Every show I ever saw her sing at was magnificent. This song has always been my favorite of hers. Thanx for reminding us of the Divinyls Michael ! I listened to the Babymetal. The music at times was promising, and at other times calculated. The girls were...well...a gimmick. I looked at the Youtube suggested links after that one and saw one that I need to share. I bought this one to encourage them and to get a FLAC copy of one that I thought was amazing, considering the participants Hope you like it.